Disney’s 1963 animated feature The Sword in the Stone is notable for being the final animated film released by the studio in Walt Disney’s lifetime. But it should probably be remembered for more than that. 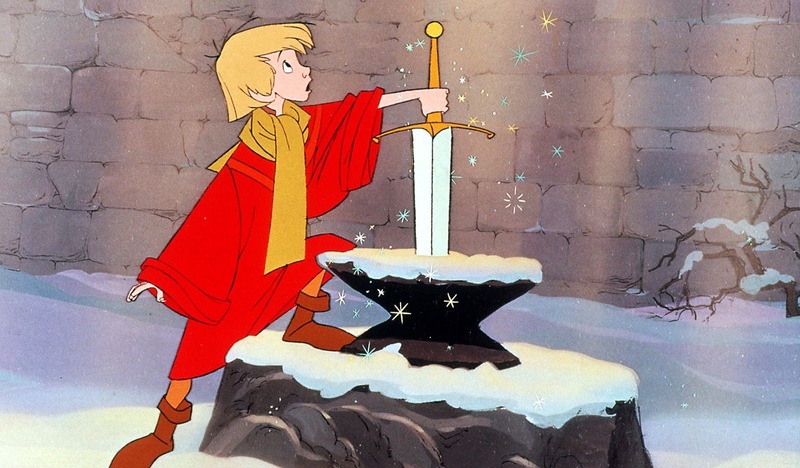 Despite a rather thin narrative, The Sword in the Stone was one of the more contemplative Disney features of its day. After decades of adapting fairy tales to animation, The Sword in the Stone was Disney’s attempt at bringing a legend to life. The Sword and the Stone is Disney’s retelling of the King Arthur legend. The film tells the story of Arthur as a young boy – referred to by “Wart” by most of his peers – who has the minimal aspirations of one day becoming a squire. But Merlin the wizard, a time-traveller and soothsayer, sees greater potential in Arthur, and makes it his job to become the boy’s teacher and mentor to help realize that potential. That’s really as far as a summation of the plot goes. The titular Sword in the Stone is only present in the opening narration and the last few scenes. The majority of the story instead focuses on Merlin trying to impart knowledge and wisdom onto Arthur in various ways (usually involving magic and transformations). 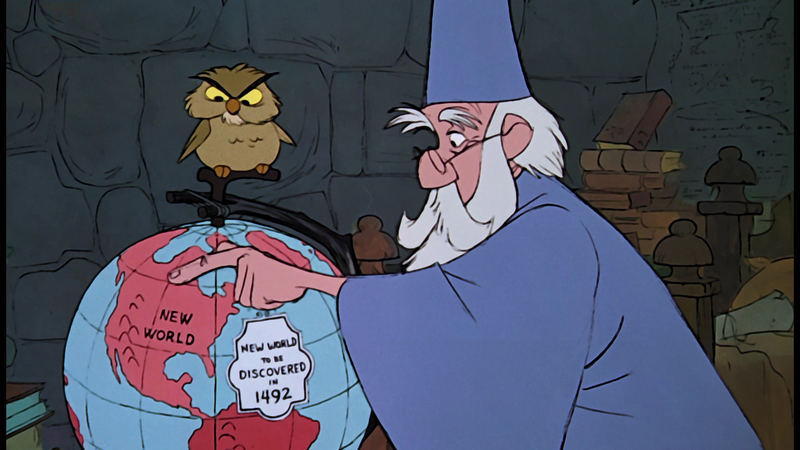 This gives The Sword in the Stone a bit of an episodic structure as it follows Arthur, Merlin and Archimedes (Merlin’s talking pet owl). On the downside, the thin narrative can become noticeable in a few of Arthur’s adventures with Merlin. But on the upside, the film has a consistently good message about the importance of education, wisdom, and creativity, and even takes some time to reflect on the profoundness and fragility of love. The animation isn’t among Disney’s best, with some moments even looking a bit rough and unpolished (Disney was spending a good deal of money on a little movie called Mary Poppins at the time). But the animation is still notable for the detailed ways the characters move, and for the effects used whenever Merlin uses his magic. There are a few small songs featured which, while far from the big musical numbers we see in contemporary Disney, are nonetheless catchy, and once again compliment the magic sequences. What really makes The Sword in the Stone work though are its main characters: Arthur is an easy character to root for as he comes to appreciate his tutoring. Merlin falls under one of Disney’s underappreciated archetypes as an eccentric, elderly magic user akin to Cinderella’s Fairy Godmother. The curmudgeonly Archimedes provides some solid comic relief. 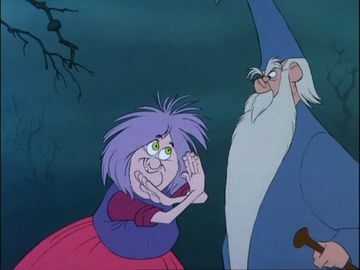 And although she’s only introduced in the film’s third act, Merlin’s rival Mad Madame Mim proves to be a fun antagonist. It’s kind of a bummer that not all of the film works on an even level, because in a lot of ways, The Sword in the Stone seemed to be ahead of its time as it told a meaningful story when most other Disney films of the era were just for the entertainment. The plot can feel a bit sparse in too many moments, and the ending in particular seems a bit rushed as it almost builds to a new conflict which is instantaneously resolved and the film comes to a close. But when it works, it really works. It’s kind of sad that The Sword in the Stone isn’t more widely remembered, because it actually had something to say. It seems only in more recent years have Disney films found a similar voice.